Let these pretty little birds keep grease marks off your table cloth by holding your butter knives. Pass the buns please! 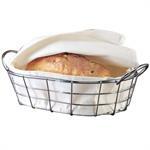 This chrome wire bread basket includes a canvas bag to keep your fresh bread, buns, rolls and biscuits warm at the table. The rustic look of these butter bells feature a hand distressed ivy pattern. 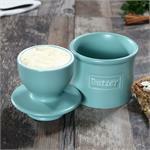 To use, fill the "bell" with softened butter, add cool water to the outer cup. Store inverted butter filled bell in the water filled outer cup. 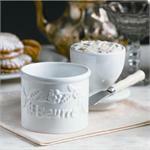 This classic design embossed with "butter" & "beurre" will compliment any kitchen. 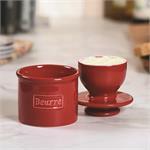 To use, fill the "bell" with softened butter, add cool water to the outer cup. Store inverted butter filled bell in the water filled outer cup. The pretty floral design will compliment any kitchen. To use, fill the "bell" with softened butter, add cool water to the outer cup. Store inverted butter filled bell in the water filled outer cup. 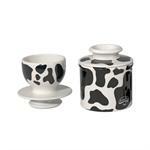 Give your butter mooo-re originality with the Butter Bell cow crock. Fill the bell with softened butter and insert it into water filled outer cup. Butter is kept at room temperature for easy spreading. 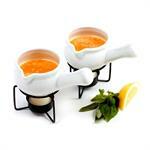 A mini warmer set perfect for 2. Melt some chocolate and enjoy dipping fruit, pound cake, rice krispie treats and more. Love lobster, crab or artichokes? Keep your butter or a seafood sauce warm while you crack, cut, dip and enjoy. 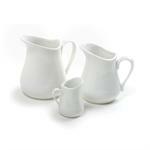 Classic white porcelain Pitchers are available in a variety of sizes for a multitude of uses. 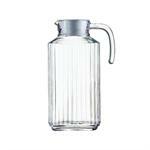 The larger 1lt pitcher is a stylish way to serve cereal milk, gravy, or sauces. Smaller pitchers serve individual portions coffee creamers and pancake syrup. 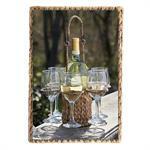 Inspired by hand woven artistry, this Wine Caddy set makes it easy to tote a wine bottle and glasses to your deck, table, or picnic blanket making it perfect for outdoor entertaining. 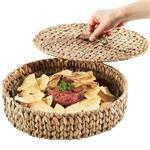 Inspired by hand woven artistry, this Garden Terrace Chip n' Dip Set will be the highlight of your garden party. 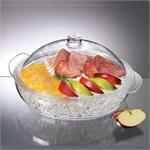 The glass platter and dip bowl are easy to clean. 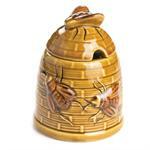 Use this charming honey bee honey pot to store and serve your honey. 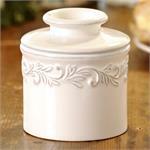 The lid features a built-in notch for spoon or honey dipper. The Luminarc Quadro Glass Jug's slim design fits in small spaces in your fridge such as in the door. Clear glass keeps your milk, iced tea and juices fresh and easily identifiable. 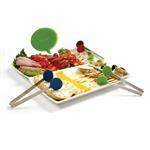 Cute meets functional with these adorable serving tongs with hold on to slippery cold cuts, fruits, and vegetables. The heat resistant silicone ends can be used in a frying pan. Adorable word bubble design embossed with 'enjoy'. This elegant three piece set keeps your dips, sauces, condiments and snacks chilled for hours and safe from food poisoning. 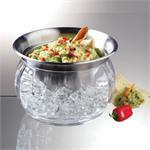 Place ice and water in lower bowl and position upper dip bowl so it rests in ice water. 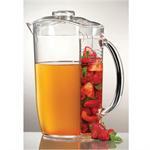 Three-in-one 3 quart infusion pitcher. The removable ice tube screws into the lid to keep the content of the jug chilled. Instill fresh citrus, berry, mint or other flavours into the drink by filling the removable fruit infusion rod with fresh fruit. Simply fill the bottom tray with crushed or cubed ice and place the vented upper food tray on the base to allow chill from the ice to flow through to the food above. The bottom tray is conveniently divided. 12" diameter natural slate platter will enhance any decor. Place the tray in the fridge before serving and it will keep your cheese nicely chilled. 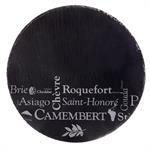 Write on the slate with a piece of chalk to label cheeses or add a bit of decorative swirl. 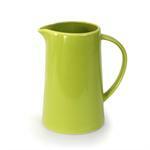 Fresh as spring, this is the perfect sized Stoneware Pitcher for water, juice or other cool drinks, or maybe you'd like to use it for big servings of gravy and sauces. Wouldn't it also look nice with a fresh bunch of your first spring flowers? 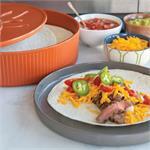 Keep up to 1 dozen burrito-sized tortillas warm and fresh with the Tortilla & Pancake Warmer until you are ready to serve. Also works for crepes, waffles, pita's, and any breads. 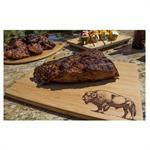 A majestic buffalo stands sentinel on the corner of this unique and beautiful bamboo cutting board. 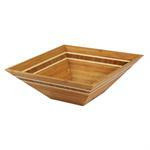 Use the perfectly smooth side as a cutting board and the etched side for a presentation tray for serving hors d'oeuvres. Right angles are right on with this 12" square inlay bowl. What distinguishes our Caribbean Collection is the contrasting end grain inlay; pieces are so beautiful you may want to leave them on the counter. Set of two bamboo puzzle shaped plates can be used individually or together to form a decorative trivet or table runner. 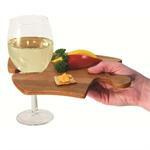 Also a distinctive individual plate to hold appetizers and a wine glass.